Hi Everyone! 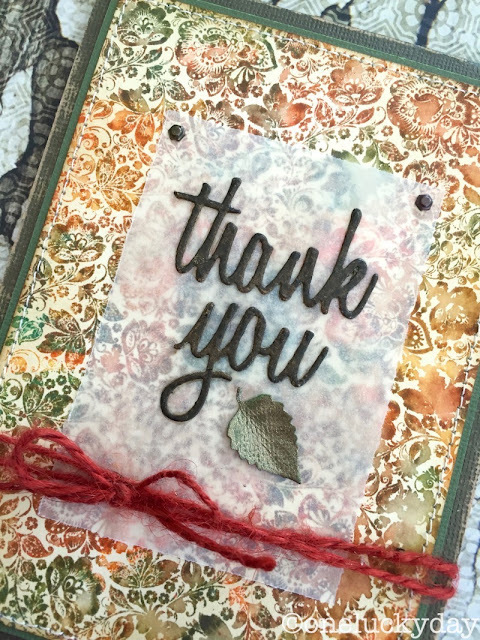 I'm here today sharing a super simple card using the new Rosette and Floret Stamp set. It's a new one from our friends at Stampers Anonymous. 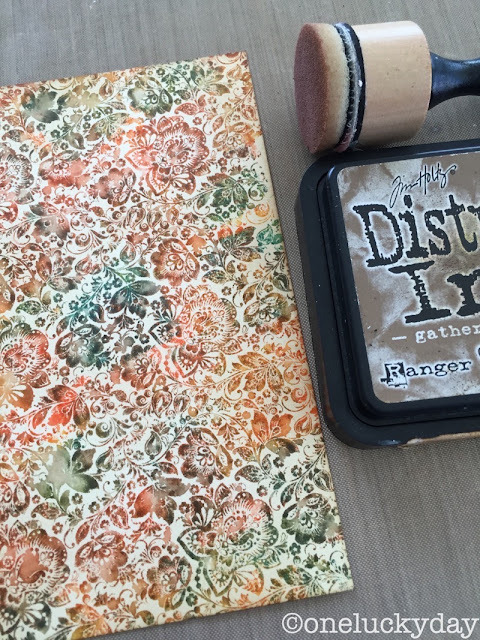 I think this is going to become a go-to stamp set for backgounds because it really can be used for all seasons from Fall to Halloween, to Christmas and Spring! For this simple card, I will be stamping the Floret image on a piece of Mixed Media cardstock for my card front. 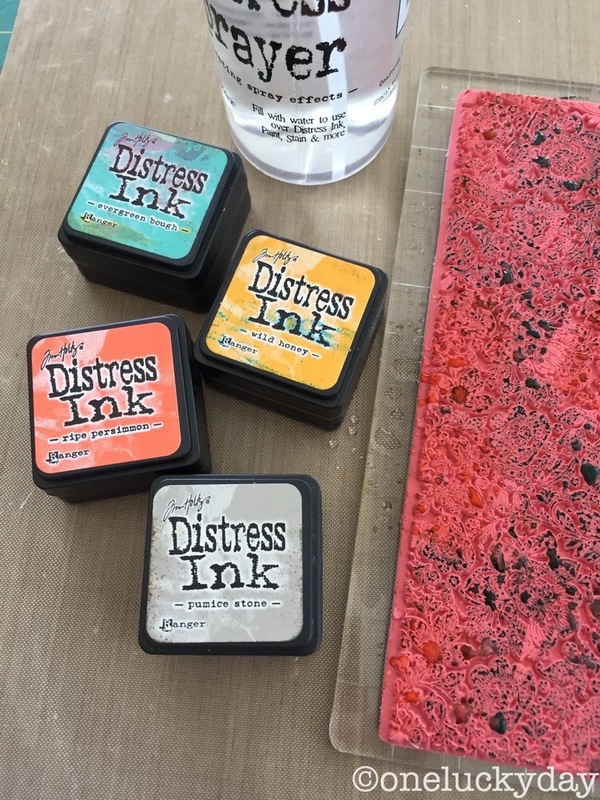 I inked directly onto the stamp with Evergreen Bough, Wild Honey, Ripe Persimmon, and Pumice Stone. One hint is to always finish with the color you started with. I find that when I am inking in layers, the first color to go on gets covered up by the others so I like to finish with it to bring it to the top. Once the surface is inked well, spray with water in a light mist to hydrate the ink. When stamped, it creates a detailed image for the card front. 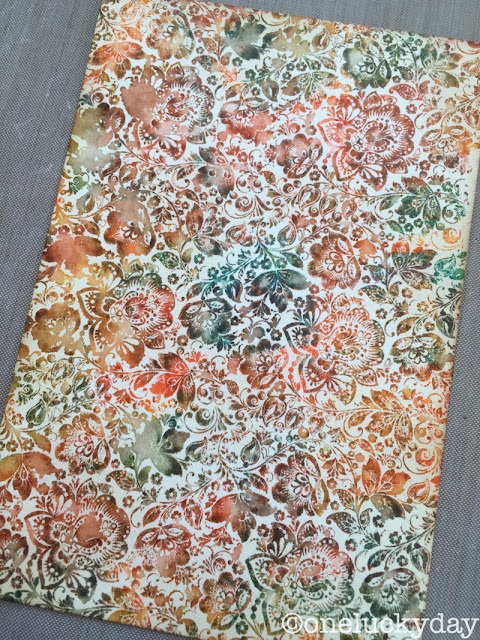 The mist of water helps the colors to blend together, creating colors that are unique to the stamping. No two images will be the same and I love that. 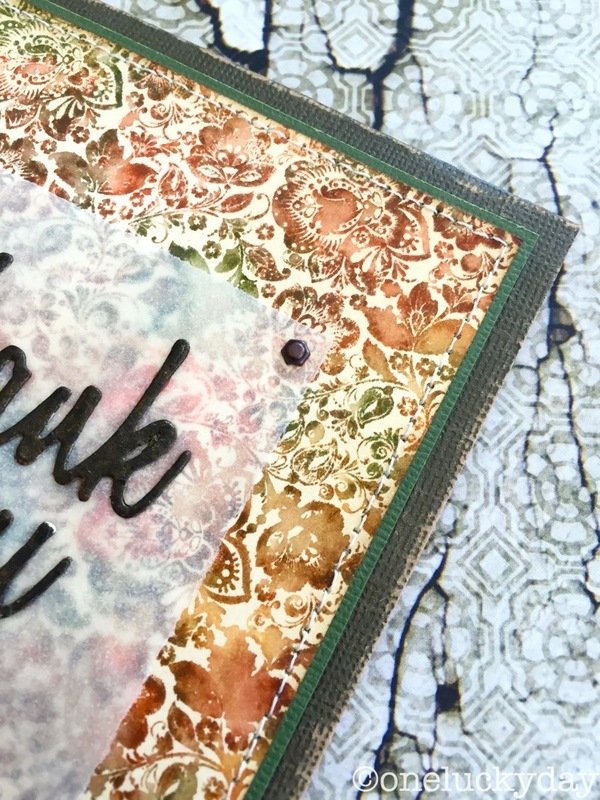 Ink the edges with Distress ink to bring a warmth to the card front. Just love the detail of the stamp. 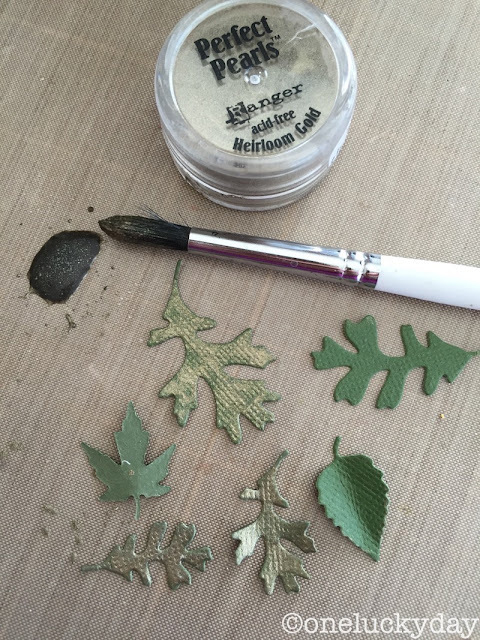 I cut a few leaves using the Fall Foliage Thinlits set. There are tiny (like these) up to large leaves in this set which makes it super versatile. I made a mix of Perfect Pearls Heirloom Gold and water with my paint brush, then painted the leaves to give them a shimmery look. In the end I only used one little leaf to keep it simple. I put the rest in an envelope for another time. The thin white paper is just typing paper that I tore using a ruler. The words are from the Celebration Words: Script Thinlits. The tissue paper is held in place using the tiniest Hex fasteners (my favorite). The brad legs are hidden between the green and brown cardstock pieces so you do not see them on the inside of the card. Hope you like this simple card and the method of stamping. I know this stamp set is going to be well used throughout the season! So pretty! Love the simplicity that gives an elegant feel! Gorgeous! That stamp is a must have. Love the detail on it. 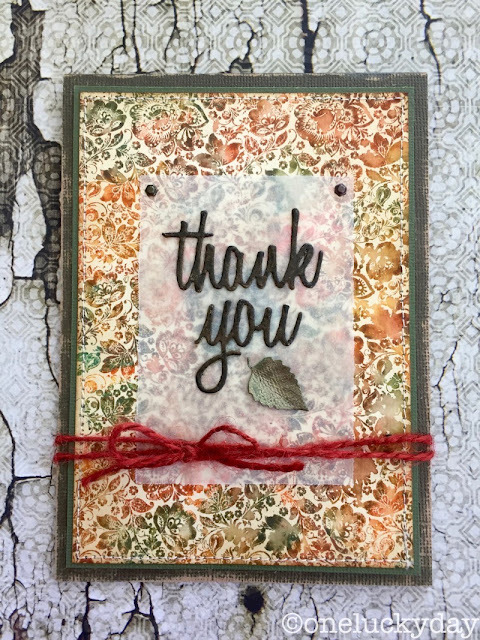 What a lovely color combo (perfect vintage) and I so agree that this would be a very versatile stamp (the detail is amazing). Such a lovely card! What a gorgeous stamp and color combo. Beautiful background! Always love your work! This is beautiful, Paula!!! Yep, I need to get that set of stamps!! LOVE LOVE LOVE! This is def my favorite stamp set this year! Great background!!! This is gorgeous! I love the Fall colors. I love this! Definitely need this stamp. I can see it for all year round uses too.